I'm sick of scheduling my weekend, like every single waking minute of it, so far in advance. I'm sick of crowded stores. I'm sick of everyone in Oregon of all places forgetting how to drive when it starts raining. I'm very sick of trying to balance out our family budget up against big holiday purchases, because that's a source of stress that begins to show itself on my face. I have stress acne this week, so I don't even want to hear anything about anything. I have a thirteen year old's complexion. Don't @ me. I'm continually surprised by my mental ability to keep eating far past when I've physically had enough. We had the work team catered holiday lunch event, and we decided to go Hawaiian. So, you bet I ate enough pork and macaroni salad to feed two big, insecure fussbudgets instead of just one. And all manner of goodies keep rolling in. Every. Day. I know, what a tragedy that I have coworkers feeding me little delicacies. Woe is me. If only I could hitch up me britches and just say no to donuts and baklava. I officially cannot say the word "no" when confronted with baklava. Little quirk of mine. The return to the gym life is going a little bit better than the diet. I got in a few good sweats this week, and lost a few of the added pounds. No joke, the facilities folks here at my office took bolt-cutters to my locker during my hiatus. Luckily nothing was in there, but I'm out one padlock and a sense of personal security. This week I've been stowing my gym attire in my old backpack instead. I'm fickle that way: if you bust open my locker, I no longer feel that locker serves much of a purpose. Dickheads. Sorry, I'm really salty at this point. Mentally, I have had better weeks. You try four straight days of pounding headaches due to losing your glasses, and see how balanced you are by the end of it. Yeah. That's happening right now, as I type these words. On a computer screen. Witness me. I've been on autopilot a little bit, and I've been on fast-forward as well. I think my brain is trying like mad to just get me through the last of this wretched calendar year. We're almost there. Is this a little bit of a cheat? Maybe. Hey, it's still eight hours of television, and I really needed something comforting, reliable, charming. 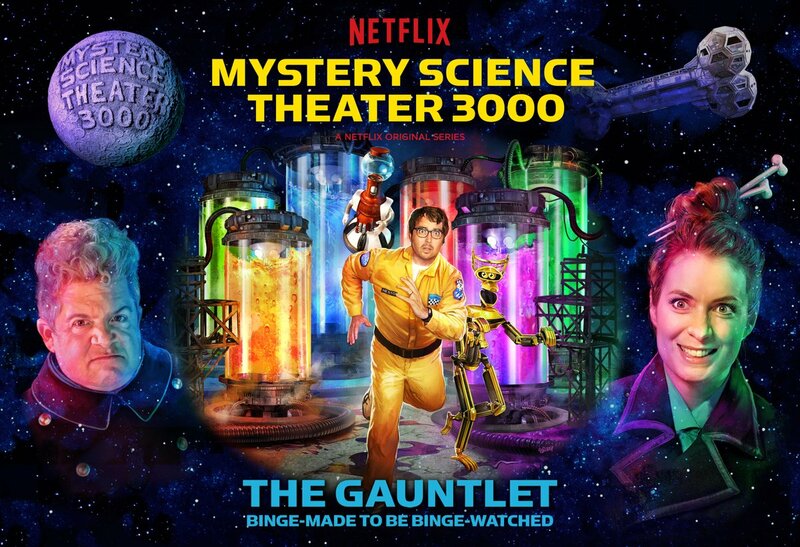 I missed this six-episode arc when it dropped last month, and while the idea of reviewing "Mystery Science Theater 3000" as I would just any other TV show sounds ridiculous, it involved less headache for me. So, have a heart? The framing device for this li'l season is that the mad scientists have concocted a six-movie Gauntlet® and push Jonah and the robots through an unrelenting onslaught of terrible entertainment. It's a cute way to suggest to viewers to play along with binge-watching all six, particularly since the season dropped on Thanksgiving day, the traditional time of year to catch a MST3K marathon. Unfortunately, this season didn't feel, to me, as much like a hallowed Turkey Day marathon as it did Netflix urging me through the characters I love to just keep Netflix streaming somewhere in the background of my life and never shut it off. The framing device also clumsily calls back to the Mitchell episode of old MST3K that saw Joel Hodgson plot and build his own escape from the Satellite of Love. Meanwhile, there's a side plot having to do with Kinga and Max paying their respects to former Mads by finding a recording from one of my personal favorite past episodes, Pod People. It's not that a serialized plot doesn't work for the premise of MST3K. It's fine if the Mads have a guest character who recurs over the whole season, and having Jonah and the robots plot a slow-burn escape is absolutely natural. But wow, if you're going to do that kind of stuff it is best to not do it in less than eight episodes, and certainly not on top of this whole Gauntlet® plot. I'm not completely convinced that binge-watching is the ideal method of consumption for the show, either, but being a Netflix Original means you cannot be designed for any other viewing than the mindless, endless variety. As far as the comedy goes, of course it is a delight. Jonah and the bots pack a lot more jokes into every second of their movies than previous versions of the crew, which was jarring at first during Season 11 when I was given hardly any time to react to a single joke before being overrun by five more. The pacing of the riffs here is more natural, I suspect due to several live tours and some feedback on that first new season. Patton Oswalt is so terrifically cast as Max (or "TV's Son of TV's Frank"), and is solid as a rock as a scene partner with Ray and with Felicia Day's Kinga Forrester, but I can't help but notice how tuned down his performance is. 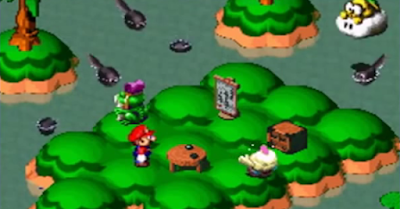 Felicia Day is absolutely game to play the primary mad scientist with an appropriately cartoon mustache twirl, and she is so much fun, but it's possible that playing against type has her using a little too much precision. Previous Mads had a more casual approach is all, while Day is very noticeably hitting marks, speaking lines written for her, and her patter just seems half a measure too slow and deliberate. Which, I suspect, is what's up with Oswalt, who is a consummate professional and tones back his enthusiasm to mirror her and prevent himself from ever upstaging her. I want it on record...I like Felicia Day as Kinga, she's exactly what the show needs in a mad scientist, and her involvement in the revival was a signal to the nerd faithful that all was well. I think maybe she's just more of a trained performer, a theater kid to the bone, than the pack of freewheeling weirdos writing for her. The movies that were picked for this shorter season illustrate a sort of turning point for the show. The previous incarnations of MST3K have always stuck to grainy old public domain garbage or the subpar scourges of the VHS era. 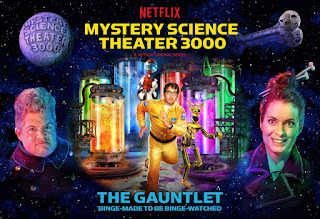 This Gauntlet® comes out with a swift one-two punch of Mac and Me, a major studio release and notorious pile of crazed idiocy, and Atlantic Rim, the Asylum-produced DVD rental knockoff of Pacific Rim. I really wasn't sure about these two selections; while Mac and Me is a bottomless well of entertaining crap, it's also possibly the only film that every bad movie podcast has done and the well ought to be dry at this point. Luckily, the Netflix era of MST3K boasts a terrific cast and head writer Elliott Kalan, whose hilarious "just go with it, we need to get through this" perspective on bad movies is all over the Mac and Me episode. My bigger concern was Atlantic Rim, as the film is the most recently made in show history and wasn't made as earnestly as any MST3K feature should be. It's a cynical cash-grab. In my experience, films earnestly made by folks who lack some fundamental ingredient are the most engaging fun-bad films. Cynical cash-grabs like Asylum lookalikes or the dreaded Friedberg-Seltzer parody movies are among the most dull, chiefly because there's no surprise. Why did they put that in? Who says it like that? 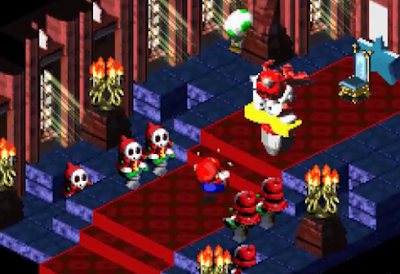 Why does the whole thing take place in this one room? Why did he get killed? This is the kind of discussion a fun-bad movie provokes, while Atlantic Rim can easily answer all questions with "Look, we just exist to trick Grandma into buying the wrong standard definition DVD. Never you mind the details." As worried as that one had me, Atlantic Rim was actually a decent enough episode and provided a couple of great running gags. The Gauntlet® moves on to much safer territory from there, with a focus on Roger Corman-style cheapos from the 1970s and '80s. The Abyss knockoff titled Lords of the Deep is a snooze and a half on its own, as is The Day Time Ended. In these episodes, the riffs of Jonah Ray, Hampton Yount, and Baron Vaughn often reach a fever pitch of shouting, chanting, or singing in what appears to be an effort to keep their energy higher than that of the movies. Once Lee Majors arrives in the refreshingly un-subtle heist/monster flick Killer Fish, followed by the Italian-made fantasy barbarian schlock Ator, I think Netflix's rendition of the beloved nerd institution officially hits a stride. Both are tried and true staples of the show: a big name star slumming it in a European cheapo with zero focus, and a muscles-and-loincloths gruntfest with childish production value and overly broad acting. They are also quite old and forgotten...which I'd say should be an exclusive mandate, if not for how good the Mac and Me episode was. All in all, existing MST3K fans will appreciate these additions to the library and certainly the timing of this season. Some of the entries are also-rans, but Mac and Me is a new classic and others are absolutely on par with some of the best stuff from Season 11. I worry that Netflix's recent startling purge of some of their top-shelf content and this season's abbreviated length and budget are signs that a Season 13 in this form is unlikely. So, on the off-chance that anyone of importance might stumble across these words, let me just say this: it's always been a damn good show for a small portion of us, and it costs practically nothing to make, so if it doesn't make as much money as "Boss Baby: Back in Business" or "Comedians in Cars Getting Coffee," that should really be okay with Netflix. Let this be a "one for the fans" scenario and just quietly fund a few more of these short seasons. Just the gesture alone is worth it. -I call it bold talk for the season to open with the whole cast lamenting how they peaked so early in Season 11 with the wonderful song "Every Country Has a Monster," only to possibly surpass it with an equally silly song later in the season. -"Pretty nice!" Over and over and over until I myself will not stop using it. Definitely the season's Best Running Gag. -One thing that Season 12 is notable for is the removal of the confusing and unnecessary commercial bumpers that had viewers scratching their heads during Season 11's commercial-free run. I chock it up to a vestigial format that Joel Hodgson tried to preserve past its expiration. The Gauntlet® also has episodes that run about ten minutes shorter and have one less host segment. -"Look, I appreciate the cinéma vérité approach, but do we really have to wait here while she goes tinkle? What's the point? Why?" -Someone in the writers' room refuses to let go of how funny it is to namedrop Reptilicus. -I'd like to give the Ator episode the silver consolation 2nd prize for Best Running Gag of the season, as I too find it really really annoying when sprawling fantasy films neglect to name any characters beyond the three or four leads.